Every Magic Day: Press Release Time! Ironically, Philip could even be doing other such appearances in the future, judging by the overall response to the TV spot. Many loyal fans as well as new clients, both young and old, tuned into the show and loved what they saw. “I did not expect so many people to respond in such a positive way, especially when we heard from so many adults!” exclaimed Philip. The company has also benefited- from an increase in business since the show aired. He has also taken the skills and love of magic he has built over the years, and started his own business, Philip and Henry Productions. Which provides a variety of magic shows for all types of people, all across North America. “We have a huge ring of Magicians all over North America, ready and willing to perform the best possible magic shows they can for us,” said Philip. Philip Murad and his team of magicians at Philip and Henry Productions have been putting smiles on people’s faces for over 20 years. The company offers a wide variety of magic shows, for all age groups all across North America. 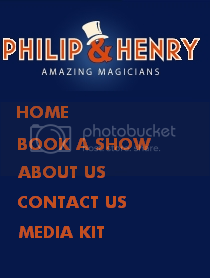 Philip and Henry Productions ensures quality performances, and highly trained magicians, who are passionate, and motivated in their field of work. For more information please visit http://www.philipandhenry.com. The This Is Emily Yeung show, features six-year-old curious host Emily Yeung, and airs on Treehouse TV and Playhouse Disney. Viewers join Emily as she journeys with a variety of guests such as fireworks experts, farmers, and now, even puppets. EDIT: You can actually check out a preview of the episode here on the Emily Yeung website.